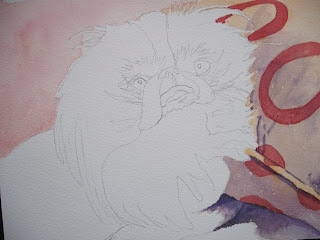 In this stage, the colours are painted on Gordon. I've given him one red eye open and one eye closed. 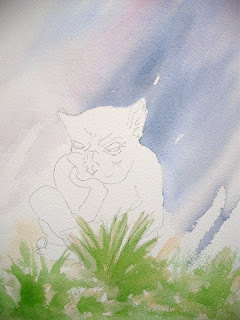 The shading helps to add to the feeling of the painting. He feels as if he's a little grumpy and bored, that he can't be doing with talking to anyone . In this stage the foreground washes are built up. 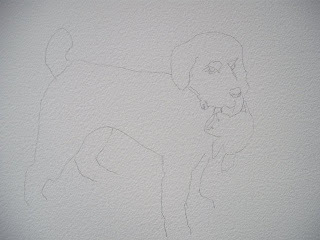 Doing this makes Gordon "sit" a bit further back in the painting. I sit back when I've done this stage and take a good look at him, before I go any further. 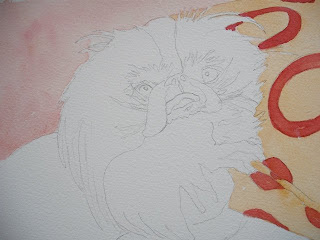 The background washes go in. Architecturally speaking, Gordon is not a Gargoyle, but a Grotesque. 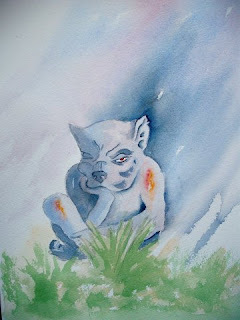 The difference being, Gargoyles would have had a water spout for dispersing rain water - their main function. Grotesques on church buildings were intended to keep evil outside the church, and possibly to remind people what hell was like if they didn't go in! 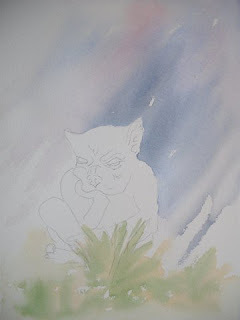 I have a few gargoyles in my garden, I love their little faces. 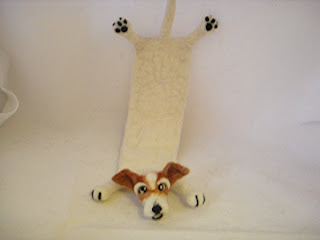 The first one was bought as a present for hubby - who promptly named him Gordon. 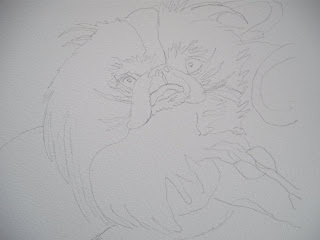 So here's the first stage, the drawing. 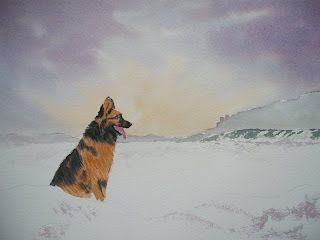 So now, in the winter, I sit at the table and paint. Nice big oak dining table, beautifully comfortable leather chairs. Missy lies behind me under the radiator, keeping warm. I get up to the computer to load the finished painting and look who's in my chair! 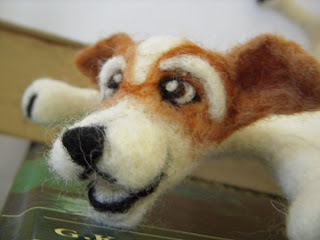 Ben McFuzzylugs created a felted bookmark of my darling Missy, especially for me, from a photo I provided. 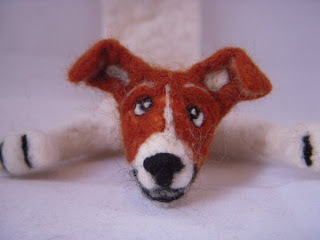 The amount of work that goes into creating these little felted pieces of art is immense - and greatly appreciated. I shall enjoy reading my books all the more now I have such a wonderful bookmark. 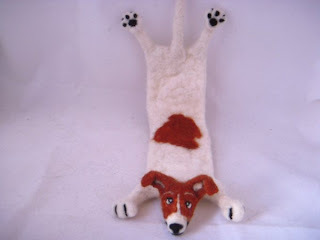 10% of every sale of felted animals goes to a bowel cancer charity . What a lovely woman she is! much loved, greatly missed.. 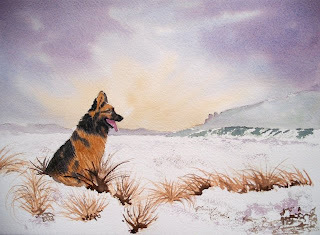 I so hope this painting rekindles happy memories for Kindly's mum. 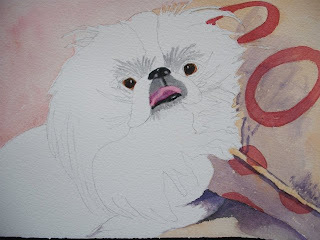 I'm happy with the features around the face so now its time to paint the tongue. A glorious tongue and a very interesting shape, one I enjoyed making come alive. 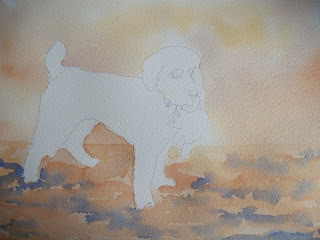 You can really feel the character in this darling little dog, now. 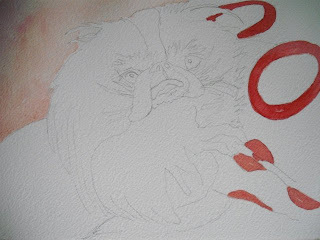 Next I'll be painting the fur and shadows and you'll see Kindly in all her glory. I have painted Kindly's eyes and nose and a few grey hairs. 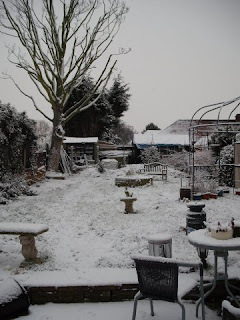 Now she starts to feel alive to me and I talk to her softly, telling her how loved she was and how much her mum loves and misses her. 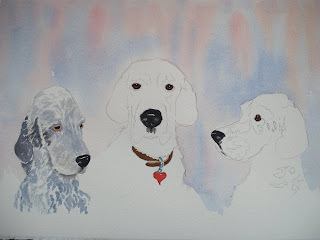 The connection helps me to paint more feeling into each and every dog I paint. 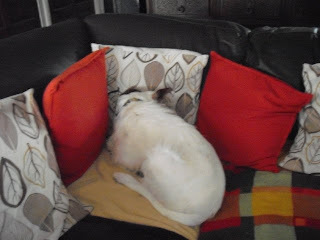 and in places under the cushion. it was time to paint the background. Because Kindly was a little girl, I chose a pink background. I also painted a base wash of red on the cushion's circle pattern. 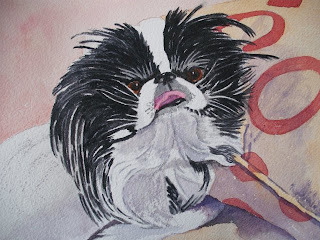 was a Japanese Chin, greatly loved and sorely missed. 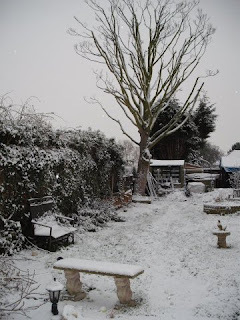 Kindly's owner worked in Battersea in the Veterinary department. 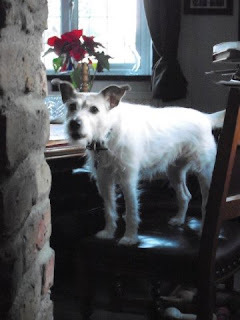 She was there when my Missy was resident, and had her in her care. 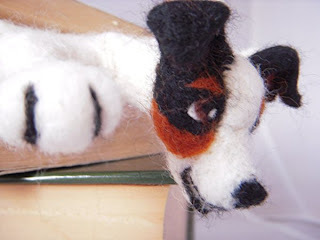 A small world that we should both meet on an online dog forum. 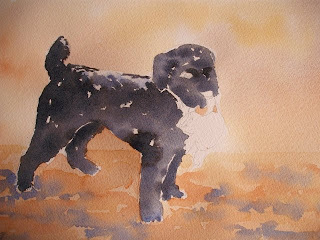 This painting is my thanks - in a small way - to the sterling job that Kindly's mum did for my Missy - and no doubt - for many other dogs. 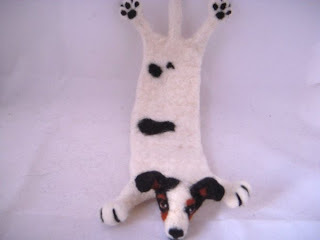 Recently one of my friends had a birthday - and for her present I commissioned two felted bookmarks from the Splat! range by BenMcFuzzylugs Click her name to see her shop. 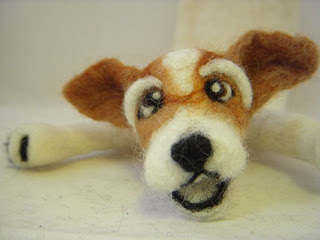 Check out my blog list to see BenMcFuzzylugs blog. 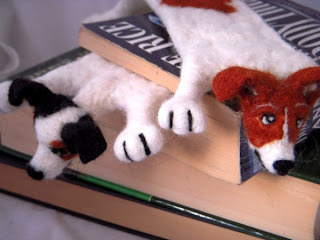 My friend loved the bookmarks - she thought they were brilliant! As Deacon gets completed, so does the painting. I'm very pleased with how it has turned out. 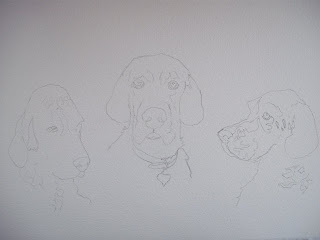 Now that Remy has been painted, I work my way across from left to right - because I am right handed. This saves me accidentally damaging what I've already painted. The darling Jamie is next in . 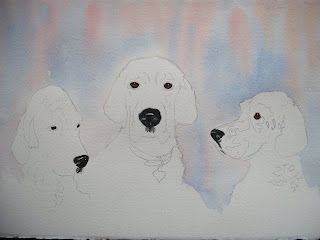 Now that the background is done, the eyes and noses on all the dogs done and my personal touch in, I progressed to painting the first dog, Remy. Beautiful girl - darling Remy. In this painting, I added in a little of myself, in that I changed the collar colour to brown and made the tag a red heart shaped one. 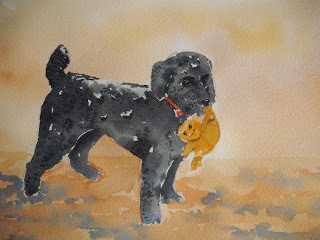 I love to add a personal touch to my paintings. 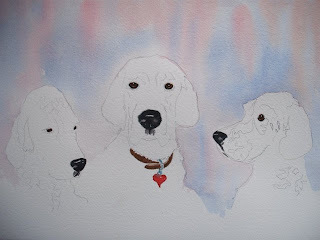 Once the background washes were in, I started painting the dogs. 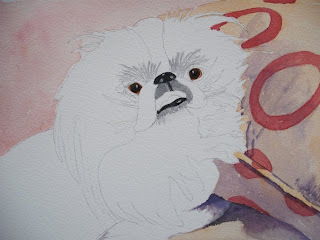 I always paint the eyes and nose first, if I'm happy with those, the painting will progress . 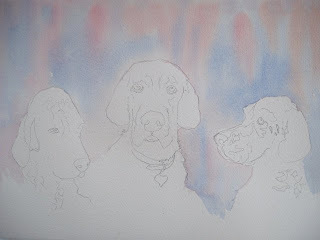 Once I was happy with the drawing of the three setters, I put in a set of back ground washes and left them to dry. 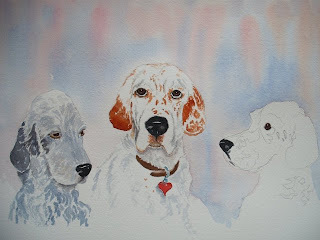 I was recently asked to paint a picture of three English Setters, all together. What? You can't see her? 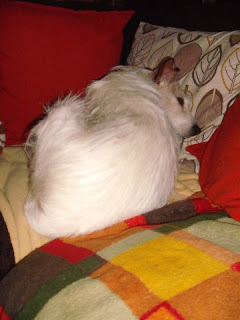 And here's Mini, after all the stages are complete. 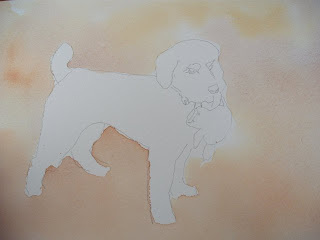 now all that is left to do is her eye, her nose, her collar and her toy and the painting is done. 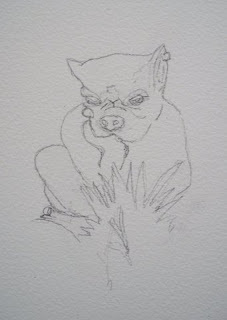 Pencil drawing of Mini, ready to paint in the loose style technique. Mini is one of two poodles, the other being Cooper. 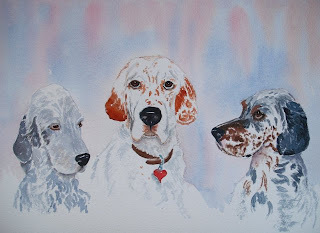 Both dogs were painted by myself and Beryl on a painting day. 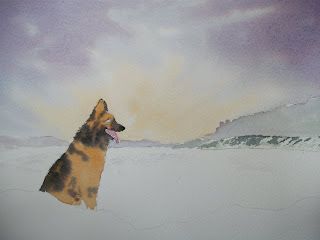 Sometimes its nice to have company when you paint. 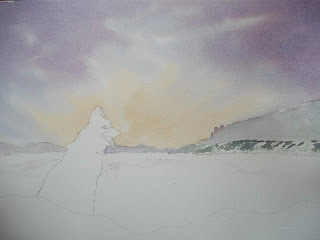 The foreground and any further shadows are all that are left to do before the painting is complete.